In this follow-up to Bullied at Home, Tai is called to her caregiver, Pandora Blake. Bully Nimue has been telling tales on Tai, and Pandora is most definitely not pleased with what she's heard about her newest ward’s behaviour. To make matters worse, Pandora has received reports from Tai’s school that she was given detention after being caught smoking weed. Pandora runs a strict household, and she sees herself as having no option but to punish Tai severely. Deeply disappointed, she gives Tai a vicious scolding, followed by a hard bare bottom caning. Tai's desire for dark scenarios in which her character is helpless and mistreated is brought to life in this transgender caning scene, which contains some seriously nasty verbal degradation. Pandora threatens to kick Tai out of her new home, and the humiliation and verbal abuse escalates along with the severity of the caning. It isn't long before Tai’s pale, curvy bottom (already reddened from her punishment during the previous day’s detention) is striped with livid cane welts. Pandora claims to take her "duty of care" seriously - but this domestic punishment is disproportionately severe, and in fear of being sent away, poor Tai has no choice but to take it. The strokes increase in speed and ferocity until Tai is sobbing under the onslaught of a shockingly hard thrashing. Finally Pandora's anger ebbs, and a chastised Tai is made to apologise and thank Pandora her for her punishment. There are lots of giggles and grins before and after the shooting of Caned at Home - which was filmed in a single take, without any cuts. As soon as the camera stops rolling, Pandora and Tai share a gleeful hug. Nimue and Pandora both praise Tai's bravery in taking such a fierce caning â and we get to see the results in some spectacular still shots. 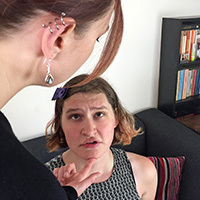 Tai insists she could have taken more, but Pandora warns that if this caning had been any more severe, it wouldn't have been possible to publish it. And Pandora and Nimue plan an opening shot which never ended up happening as the intensity of the scene drives it out of their minds. At the end of a full day's shooting, Pandora and Tai talk about the scene they've just filmed. Tai is disappointed that she didn't cry, but she's happy that her desire for bruises has been fulfilled. They discuss differences between shooting a theatrical feature like Houseboy, and a day of shorter scenes like this one (more kink per hour, to paraphrase Tai). We hear how Pandora felt playing such a mean character, and Tai talking about her lust for tears. 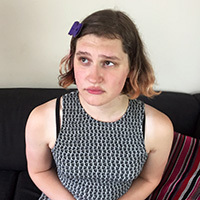 There's some frank discussion about personal kinks, the fetishising of trans bodies and sexuality, and how Pandora and Tai are both working to challenge the stereotypes. Thanks Joe! So glad you liked it. This is the sort of fantasy that really presses my buttons too. I could never take a hard/fast caning as well as Tai, but oh, such a hot fantasy! A proper caning! Nothing lacklustre about that! I'm not sure I could take 6 of those strokes let alone 24. Tai has got more guts than I have (at the moment anyway)! I know right? It's so impressive. When I was editing it I had to watch with one eye closed and it made me pretty anxious that I was going overboard. I couldn't believe it when we stopped filming and she insisted she still hadn't had enough! Thank you jimbo! Glad you enjoy our varied offerings :) I am a big fan of Tai's beautiful bottom. So curved and shapely! Tai's bum looks beautiful and sore. Pandora a Happy New Year from Tim and best spanks from Tim . Thanks Tim - Happy new year to you! Fist of all Wow! This is an incredibly intense film so very well done everyone. Pandora, I don't think you have ever sounded stricter or sterner in your extended scolding of Tai before and during her punishment. And Tai takes the cane with a great deal of dignity considering the length and strength of the punishment. For me the film reaches a real climax when you turn up the scolding tone towards the end and then begin a faster series of strokes. I sort of think of this technique as cane-spanking, because the pace starts to approach an OTK spanking speed briefly. And it really is punishing to have quick consecutive strokes like that. Before the sting of one stroke has chance to even begin to subside in comes another and again and again until your bottom feels on fire. And that really is exhilerating even though it's so intense and one part of you wants it to stop, while the other says go on (well maybe! - certainly I bet Tai wants it to!!). Of course in terms of the storyline, little Ms Nimue has completely pulled the wool over your eyes and is obviously the darling of the home. Obviousloy begging for some come-uppance at some stage! Thanks Yianni! It was an unusually horrible character for me to play, and I admit to feeling a little anxious both on the day and when I was editing it in case I'd taken it too far, but I have to admit the sadist in my really enjoyed it. It's such a pleasure to be able to administer canings that are both hard and fast - that regular, fast-paced caning rhythm is a common feature of my fantasies, but it's rare to find bottoms with a high enough tolerance to take it. Tai is a wonderful performer and play partner because she knows her own limits so well, and has such an amazing appetite for corporal punishment. I was thinking I'd have to reassure her - but as it turned out, she was the one who ended up reassuring me! That fast hard bit of the thrashing was the bit that pressed my buttons when I first watched through the finished film. But this scene is sadistic enough that I thought it was important to make Tai's enthusiastic consent super clear - I'd hate for this to end up on a tube site without the behind the scenes video and interview, and for there to be any ambiguity about whether or not she's into it. I definitely agree this setup has potential for future episodes, if we get the chance to film them! I applaud your conscientiousness around limits and emphasis that this is fantasy play. It is very clear that Tai gets a deal of pleasure from this intensity of correction and valuable I think to include the surrounding out of role interview/chat in the one film.